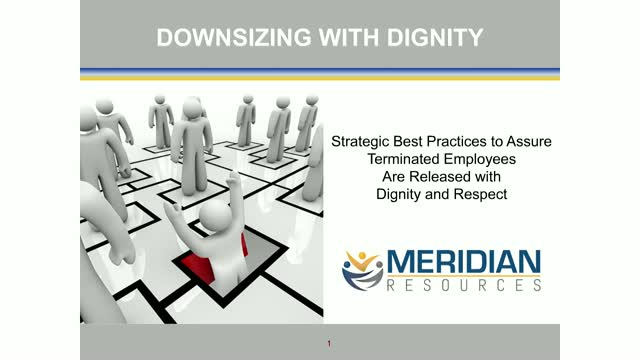 Meridian Resources delivers intelligent talent management solutions that encompass the full spectrum of the employment lifecycle, including strategic hiring, new leader integration, engagement, development, retirement, and organizational exit. The foundation of Meridian’s proven talent management methodology is a combination of individualized, proactive coaching in conjunction with the application of science and data to evaluate, measure, and improve the effectiveness of the most important organizational asset – people. The termination of an employee is never easy and although there is no exact science to the process, there are measures that can be taken to lessen the adverse impact of emotional, legal, and safety issues that might arise. Surprisingly, even the most seasoned human resource professionals and managers are often at a loss for the most appropriate actions during such an event, which results in a less than dignified situation for the affected employee. This webinar will guide you through the essential elements of developing a strategic plan to ensure you and your management team navigates through the termination with the best possible outcome for all involved.